We should not forget that Jesus chose to be born a Jew, and therefore to be circumcised according to Jewish law, to live as a Jew with His mother, cousins, disciples and His friends in Bethany, Cana, Bethsaida, Capernaum...and to teach His brothers under the colonnades of the temple of Jerusalem. One had to be a pure Jew and circumcised in the flesh in order to cross the Gentile courtyard and enter the court of sacrifices of the great temple without risking one's life. Although there were about 120 disciples present at the time of Jesus' ascension (mentioned in Chapter 1:15), this figure quickly reached 3,000 at Pentecost and 5,000 in a few days (Acts 4). Between Passover and Pentecost those close to Jesus lived secluded and barricaded in their famous "upper room" (Cenacle) near the Mount of Olives. But at Pentecost the apostles and disciples experienced a radical change. A new power practically freed them from their fear and agony. So much so, that they dared to attack the Sanhedrin directly, accusing them openly in the temple, of conspiracy, injustice and murder. Not only did the disciples begin to speak and understand different languages, they performed many public miracles, which only served to further ignite the hate of Pharisees and the chief Jewish High Priests. Acts 4 v 32 And the multitude of them that believed were of one heart and of one soul and they had all things common Acts 9:31 Then the churches had peace throughout all Judea and Galilee and Samaria... One day Peter healed a paralyzed man in Lydda. Then he resuscitated a woman named Tabitha in Joppa. Acts : 10 v 10 While in a trance, Peter saw the heaven open, and a big sheet be lowered down. In this sheet were all the birds, four-footed beasts and reptiles of the Earth. Apparently, these were mostly animals that the law of Moses forbade him to eat. Nevertheless, Peter heard a voice that told him: "Kill and eat." Peter did not allow himself to eat what the law of Moses forbade him to eat. · Not so, Lord; for I have never eaten any thing that is impure or unclean! · What God has cleansed, that call not you impure. Peter did not know how to interpret this vision. Yet on entering the house of Cornelius the centurion, he understood what God asked him to do: baptize the Gentiles (Romans). This baptism brought on the reproaches of his Jewish brethren who had remained in Jerusalem. Then hath God also to the Gentiles granted repentance unto (eternal) life. Then Barnabas went to Tarsus to seek out a new convert named Saul who would become Paul. Romans 2:28 - For he is not a Jew who is one outwardly; but he is a Jew who is one inwardly. The new circumcision is that which is of the heart, by the Spirit, not by the letter. Paul to the Colossians 2:11 - In him you were also circumcised, in the putting off of the sinful nature, not with a circumcision done by the hands of men but with the circumcision done by Christ. Having been buried with him in baptism, you were also raised with him, through your faith in the power of God. One can imagine the turmoil created by Peter who throws the doors of the new church wide open to Gentiles, considered IMPURE and rejected by most people born into the Jewish religion, and who became the first pillars of the Christian Church. Acts 4 - After having healed a man crippled from birth (40 years), Peter and John entered the great temple of Jerusalem to preach under the colonnade of Solomon, where Jesus used to stand to teach the crowds of Jews. Following the orders of the captain of the temple guards, they are apprehended and thrown in jail. The next day they appear before the Sanhedrin, who releases them while forbidding them to preach in the name of Jesus. Acts of the Apostles 5 - But they didn't obey; on the contrary, the disciples all met together in Solomon's colonnade. The apostles performed many miraculous signs and wonders among the people. When Peter walked down the street even his shadow healed the ill, which is why so many people came from neighboring towns, and were all healed. The Sadducees (representing the families of the Jewish aristocracy in Jerusalem) were filled with jealousy. They arrested the apostles, throwing them into the public jail. During the night, an angel opened the doors of the jail and the following day they were again teaching in the temple. The apostles were brought back before the Sanhedrin. They were "let go" after having been "flogged". Acts 6:7 - In the presence of Saul (later to become Paul) the deacon Stephen was summarily judged and stoned for blasphemy. Five times I received forty lashes minus one from the Jews. Three times, I was beaten with rods. Three times, I was shipwrecked, and I even spent a night in the open sea. In Damascus I was lowered in a basket from a window in the wall. Acts 21 - Paul was beaten by Jews in the temple of Jerusalem. A Roman commander arrested him to extract him from angry Jews who accused him of having brought his non-Jewish Greek friends (although recently baptized) into the sacred temple. Acts 22 - The commander ordered Paul to be questioned with a whip in order to discover the reason behind the Jews' anger. Under Roman protection, Paul was taken to the Roman headquarters of Caesarea where he was put in jail for two years, before being sent to Rome to be judged by the Emperor. ANDREW, brother of Peter - First a disciple of the Baptist, he became the apostle of the Scythians. Crucified on an x-shaped cross in Patras, Greece, in 64, he continued to preach his faith and love for the Christ for two days until he died. JAMES the Great - Brother of John and son of Zebedee, he was tortured in the year 44 by order of King Agrippa I.
JAMES the Less - Son of Alphaeus and cousin of Jesus, he was the first bishop of Jerusalem. In 62, he was thrown off the temple walls by Jews, who then finished him off through stoning. His mother was one of the three women named Mary under the cross when the Christ was executed. JUDAS or Thaddeus - Brother of James the Less (Acts 1:13), he is believed to have died tortured in Persia with Simon the Zealot. SIMON the Zealot, called the Canaanite (he was probably from Cana in Galilee) - He was (as his second nickname indicated) a MEMBER of the party of the Jewish Resistance. He is believed to have died martyred with Thaddeus in Persia. MATTHIAS, from Hebrew (the gift) - Chosen by a drawing of lots to replace the infamous Judas Iscariot, he is believed to have followed Jesus ever since his baptism by John the Baptist and died martyred in Ethiopia or in Jerusalem around 63! MATTHEW, or Levy, the author of a Gospel - Publican, collector of taxes in Capernaum before the call of the Lord. Died a martyr in Ethiopia in 61. THOMAS, also called Didymus (the twin) - He showed his doubting nature when he asked to touch Jesus' wounds after his resurrection, but also his courage when Jesus decided to leave Trachonitis (on the east bank of the Jordan river) for Bethany to bring Lazarus back to life. Knowing the Jews wanted to kill Jesus, he said to the other disciples hardly eager to die: "Let us also go (to Jerusalem), that we may die with him." (John 11:16) Thomas is the patron saint of India and believed to have died martyred at Calamina (Mylapour), near Madras. I been with you such a long time, and yet you do not know me? He that has seen me has seen the Father! He left to evangelize Scythia and Phrygia (Asia Minor). According to the Church tradition, he died a martyr (crucified?) at Hierapolis, near Ephesus, near 80. BARTHOLOMEW - or, as called by John, Nathaniel. He was very skeptical at first, when he learned that the Messiah came from Nazareth, but when Jesus revealed what He knew about him, he was literally staggered! He is believed to have been burned alive in India, or possibly Armenia. The Lord had ordered them to 'love thy neighbor'; they obeyed their Lord even when it required the utmost sacrifice: their lives. The blood of the Apostles flowed as that of their Lord to prove that they believed in their MISSION and their Lord. He did say one day: There is no greater love than this, that a man lay down his life for his friends. Death of Emperor Tiberius in Campania in suspicious circumstances. Gaius Caligula, son of Germanicus, succeeded Tiberius. He was 25 years old when he acceded the throne, causing great joy among the people. But he had suffered from epilepsy since his childhood, and the illness worsened in the first year of his reign, weakening his mental state until he became quite mad. He ordered the death of many citizens and senators such as the son of Drusus, Silanus, the sinister Guards Commander Macro (the executioner in the Sejan affair), etc. He exhausted the treasury and ruined taxpayers by ordering unlikely actions, such as the removal and replacement of various hills of Rome. He cut tongues off circus spectators and threw them to the lions in the arena because victims were lacking. He imprisoned his own soldiers and made his favorite horse Consul, also covering it with precious stones. In the memory of Marc Antony, his great-grandfather, and the Egyptian servants he remembered from his childhood, he was worshipped as the new Sun King. He was murdered by his guards on January 24, 41. Son of Drusus and nephew of Tiberius, he succeeded Caligula. Claudius, born in Lyons in -10, had a mediocre build and stammered perpetually, but was a very learned and scholarly man. Unfortunately, just one year before he acceded the throne, he married Messalina, a sixteen-year old girl who was very beautiful but unscrupulous and very promiscuous. She gave Claudius a son: Britannicus (the name was a homage to Rome's recent victory in Brittany) and a girl, Octavia. Taking advantage of Claudius' absence during his trip to Ostia, she went so far as to be married publicly in Rome, to Silius, her favorite lover! Narcissus, who had warned Claudius about this marriage, feared the Empress' vengeance, and preferred to kill her before the indulgent Claudius forgave her. Claudius swore that he would never remarry, but succumbed to the charm of his niece Agrippina, who had just celebrated her 32nd birthday. The new empress persuaded Caesar-Claudius to marry her son Nero (from her first marriage) to Octavia - Claudius' legitimate daughter. Agrippina poisoned Claudius with mushrooms when he began to realize that the empress was trying to push Britannicus away from the throne, in favor of Nero. Claudius took too long to die, so Agrippina (who was also Caligula's sister) got her doctor to finish him off in 54. Everybody died but thanks to the gods I survived! The people's anger roared. A scapegoat was sought... Nero was relieved when the Christians were accused of having started the fire in the various districts of Rome. Didn't these Jewish dissidents talk about an eternal purifying fire where Gentiles would burn? 1. A man called " Simon PETER or Cephas "
Ancient sailor of Galilee and faithful companion of Jesus of Nazareth, crucified by Pilate in the year 30, he became the leader and spiritual father of this new religion that preached non-violence and love...It is not known through what chance of fate he happened to be in Rome in the year 64 when the search is one for the "Christians" accused of having started the colossal inferno in which many burned to death! Pursued from all directions, any Christians that were able to took refuge in the mazes of the Roman catacombs. One day, when you are old you will stretch out your hands, and someone else will dress you and lead you where you do not want to go. The old fisher from Galilee turned back and let himself be crucified upside down, because he considered himself unworthy of dying in the same position as his Lord. His brothers buried him under the basilica that bears his name today, where one once found the "gardens of Nero". Paul was a former Pharisee and Doctor of the Jewish LAW. He had himself joined the Jews in hunting down Christians. He converted to Christianity on the way to Damascus, but now his former Jewish brothers of the Sanhedrin wanted to kill him. Confined to Caesaria to escape the Sanhedrin, Governor Felix took him under his wing. Nearly acquitted by Porcius Festus, Felix's successor, as well as by King Agrippa II and Berenice II, he would have been released if he had not asked to appear before the emperor as a Roman citizen. Having arrived in Rome in 62, he it would have been cleared and freed in spring 63! Some affirm that he remained in Rome, others that he returned to Ephesus to visit his disciple Timothy. Apprehended in Troas and taken back to Rome, he was put back in jail in 67 with other Christians that were given to wild beasts to graze upon! Demanding the application of Roman law, Paul, as a dual citizen, asked to be decapitated. According to legend, when he was executed, his head bounced on the ground three times, opening up three fountains. From then on, the first Christians called that spot: the place of the three fountains... "
His body was taken to the vault of a Christian matron, called Lucina on via Ostia, where the basilica of Basilica of Saint Paul (Outside the Walls) now stands. Then, a terrifying hurricane over Rome left more than ten thousand homeless. Before cutting open his wrists in a banquet, the poet and philosopher Petronius, Nero's professor, wrote to him as he died to say how bad his art was and how difficult it was to bear hearing his songs... The emperor had everything that belonged to him destroyed! After marrying Caecilia, Nero left Greece to attend the Olympic games. But there, he fell in love with Sporus (a young blond man that he had castrated). But the danger came from Spain, where the General, Governor Galba, had just celebrated his 73 birthday. It was he who, in the absence of Nero, drove the people to revolt. Alas! What an artist is dying in me! GALBA (68 - 69), who was proclaimed Emperor of Rome by the Senate, but because he had named the young PISON to be his successor, his rival OTHO had them both slaughtered by the Praetorian Guard and seized the power. OTHO (69) was proclaimed Emperor by the entire empire except in Germany, where the legions proclaimed Vittelius emperor. Defeated in Bedriac, he committed suicide. VITTELIUS (69) walked on Rome after the death of OTHON. He was unable to impose his authority, and the Eastern legions proclaimed Vespasian Emperor in July 69. Vittelius was defeated in October in Cremona, after which, the people of Rome cut his throat in the forum. VESPASIAN (69 to 79) Son of a publican, he led the Roman armies against the Jewish uprisings in Palestine. It was there that in July 69, he learned that he had been proclaimed emperor by the Eastern legions. He let his son Titus take over the military command. Titus established his authority over all of Palestine before returning to Italy. In 79, Titus ascended to the imperial throne after his father. YEAR 69 to 79 : The reign of Titus Flavius VESPASIANUS. Barely upon his arrival in Rome, in the year 70, Titus had to repress a rebellion lead by the German leader Claudius Civilis, who controlled territories near the mouth of the Rhine (Batavia). In spite of the many Gallic tribes supporting the uprising, Titus succeeded in repressing it and demanded that a peace treaty be signed. During the Vespasian reign began some major construction works, such as the Coliseum and the restoration of the Capitol temple. In the year 66, the Roman procurator in Palestine (Gesslus Florus) was accused of stealing 17 talents of GOLD from the reserves of the temple of Jerusalem. The Jewish revolt was broken by the sword, but hundreds of houses were plundered by Roman mercenary soldiers and many of the inhabitants killed. Rebel leaders were "flogged and crucified." A storm of revolt blew over Israel. In the year 68, all of the chief fortified cities of Galilee were attacked by Roman legionaries. Jewish rebels were massacred or deported with their women and children to be sold as slaves on foreign public marketplaces. The former Jewish general Joseph Ben Matthias, military commander of the fortified cities of Galilee, surrendered to the Romans, and after having gained their trust, acted as a mediator to help the last remaining rebels understand that their resistance to Rome was in vain and could only end in disaster. He became a friend of the Emperor Vespasian, who welcomed him to Rome and offered him his old villa. Joseph then added the name of his protector to his own and became the historian Flavius Josephus. Titus, son of the new Emperor Vespasian, succeeded him as commander of the legions in Judea. He had the thick outermost ramparts of the city of Jerusalem demolished and used them to build platforms of attack to reach the level of the inner ramparts. The holy city was besieged on April 9 of the year 70. A terrible massacre followed! According to Flavius Josephus, this revolt caused the death of one million two hundred thousand Jews; according to Tacitus, six hundred thousand. The last point of resistance was MASSADA, an old fortress that Herod had made into a palace, situated on a rocky summit, where 960 zealots had barricaded themselves with their families. To reach the top of the ramparts, the Romans built an gigantic siege ramp that Jewish slaves were forced to push to the foot of the fortifications. All hope was lost. The defenders preferred to commit mass suicide rather than become slaves. The only survivors were two women and five children who had hidden themselves in underground caves. AD 79 - 81 - The reign of TITUS Flavius Vespasianus. Titus was passionately in love with the Jewish princess Berenice with whom he was having an affair despite an age difference of 20 years. Titus took Berenice to Rome in 71AD but as his father made him successor to the imperial throne, Titus did not dare to offend popular feeling and refused to make her his official wife.During his reign there was another terrible fire in Rome, as devastating as the one in Nero's reign in 64AD. Half brother to the previous emperor, he rebuilt Rome and reigned as absolute ruler persecuting both Christians and intellectuals who criticized his bloody repression. He was assassinated by one of his slaves with the aid of the empress Dometia, who was otherwise known as the bald Nero. AD 96 - 98 - The reign of Marcus Cocceius NERVA. This 72 year old man quelled the tumults brought about by his predecessor and in 97AD he adopted Trajan whom he designated as his successor. AD 98 - 117 - The reign of Marcus Ulpius TRAJAN. He was the son of a simple soldier and in 96 he was appointed governor of Germania. He relaunched the conquests of the East by annexing the rich gold mines of Dacia. He then conquered Armenia, Assyria and Mesapotamia. Being of a conciliatory nature he published an edict prohibiting the persecution of Christians for their religion. However, in 115AD there was a revolt of the Jews in Greece, Egypt, Cyprus and Mesopotamia and now the governors no longer made the distinction between traditional Jews and Christians! Dion claims that 220,000 Jews were massacred without counting the 240,000 Jews in the Island of Cyprus. For a long time no Jewish family was allowed to disembarque on this island for fear of Roman reprisals. Hadrian was the adopted son of Trajan whose niece he married. He was the legate to Syria when a little after his return from the Orient he learned of his adopted father's death. He renounced the conquests of ancient Mesopotamia and chose to consolidate the European frontiers. In AD 130 Emperor Hadrian wanted to build a temple dedicated to Jupiter in Jerusalem. He published a decree prohibiting circumcision and the teaching of the Jewish law. This war was even more bloody than the first one, because the revolt, led by Bar-Kokhba (or Cocheba) who claimed to be the Messiah, cost the lives of around 580,000 men, not taking account of women, the old, the infirm and children! 985 Jewish villages were entirely destroyed. Bar Cocheba died whilst defending Bethar. Many Jews were sold into slavery so much so that they were worth less than a horse. According to Dion Cassius, certain Jews hid themselves underground and died of hunger whilst others turned to cannibalism. Hadrian forbade the Sabbath and all the rites. The Jews had only one day when they could lament over the ruins of the temple. Jerusalem was razed to the ground and replaced by a new Roman City "Aelia Capitolina" where many pagan temples sprang up dedicated to Jupiter, Venus and Diana. And so Jesus' prediction concerning Jerusalem fulfilled itself according to Matthew Ch. 24 "no stone shall remain unturned". Little by little Christianity spread through the whole of the Mediterranean area: Syria, Phoenicia, Turkey, Greece, Rome and even Gaul. The apostle Paul, whose second profession (after that of being a rabbi) was to make tents, went on preaching tirelessly "the good news" to other nations, often at the peril of his life. During his third journey Paul, whose title was rabbi, a professor and teacher of Jewish law, lived for 3 years in Ephesus, a large town situated to the north of Millet and to the south of the ancient town of Troy, opposite the island of Samos ( Ephesus is part of today's Turkey). Through his great faith he started a devout Christian community but had to flee from the angry jewellers of Ephesus who made money from pagan cult practiced in the great temple of Diana. If the dead are not resurrected, why do we put up with danger everyday? I die everyday. If I fought with wild beasts in Ephesus for merely human reasons, what advantage have I gained? Can you imagine for one moment the apostle Paul being thrown into the Ephesus arena, forced to fight with ferocious beasts that want to devour him, all for the sole pleasure of the spectators and the magistrates. And yet not long before his arrival in Jerusalem, he wrote to the brothers in Rome to tell them of his next visit during a planned long journey to Spain. (He never got to Spain). You will love your neighbor as you love yourself. Love never harms the other person. In loving your neighbor you fulfill the law and do the will of the eternal Father. It is not those that hear the law that are just in the eyes of the Lord, but it is the ones that obey the law and practice it. When the gentiles who have not been taught the law behave in such a way that they honour the law, they show that the requirements of the law are written in their hearts and in their inner secret consciousness. The day will come when God will come to judge men and their intentions. The healthy do not need doctors. I have not come to call upon the just. I have come for the sinners instead. Those who suffer and those who have sickness in their soul. Come to me and I shall give you peace. Ephesus: A large pagan city beside the sea. Ephesus was a city of riches, known for its bankers who lent fabulous amounts of money to the neighboring states. Its splendor was comparable to that of Venice in the Middle Ages. In the past, surrounded by hills and great green forests, Ephesus used up its forests in order to develop and expand and to build many maritime fleets. Little by little the green hills became replaced by desert. Ephesus was a great seaport, but its temple to Artemis was burned down in AD356 by Erostrate who wanted to make himself famous by this vile deed. Erostrate was burned at the stake for this and the temple was rebuilt with such great opulence that it became one of the seven wonders of the ancient world, whilst Artemis became the Roman Goddess Diana. It was in this city that the nascent Christian community developed. It is here that the main figures of Christianity came to gather: Paul, Peter, John and Mary (mother of Christ) as well as many other exciles who were fleeing the persecution of the Jews. Today the house where Mary lived can still be seen. It was in 64AD that Rome was burnt and that was the beginning of the persecution of all Christians scattered around the Roman Empire. Between 66AD and 70AD began the persecution of the Jews in Jerusalem, who revolted in great numbers against Rome. Ephesus became for a time the cradle and capital of Christianity. Everyone shared their goods and their bread which greatly surprised their incredulous neighbours who envied them and said -"see how they love one another". 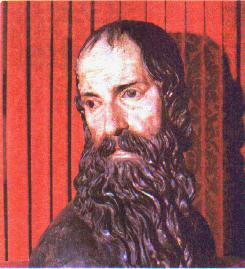 John was the victim of the persecution of Domitian (half brother of Titus). According to Tertullian he is supposed to have been taken to Rome and for his beliefs thrown into a cauldron of boiling oil from which he miraculously emerged unharmed.
" My dear children, my beloved". These were the words of love that were endlessly repeated with him by Peter, James (the son of Alphaeus, cousin of Jesus) and his son Jude (Acts I v13). That was the main message that John, the last of the apostles to have seen and touched the living Lord on Earth, would repeat over and over again. It became like a leitmotif and his legacy to the new generations of Christians. Thus it is in the first epistle that "my little children" is repeated 12 times. The word love is repeated 15 times and, as in Jesus' last message it became the testament of the disciple that the Lord loved a little more than all the others. It was John who during the last supper put his head gently on the Lord's shoulder, because somehow he sensed, more than the others, how sad the Lord was that evening about everything that was going to happen and that could not be avoided. Neither suffering nor exile, nor the atrocities that befell his companions would ever change the sweet nature and affection of this old man who would become the only one of the 12 apostles to rejoin his master through a natural and non-violent death. Dearly beloved, let us love one another, for love is of God. If someone possesses all the goods of the world and yet seeing his brother in need he has no pity in him, how can the love of God be in him? Little children, see what love the Father shows you, so that we may be called the children of God. He that cannot love has never known love. For God is love. Whoever lives in love lives in God and God in him. There is no fear in love, for perfect love drives out fear because fear has to do with punishment. The one who fears is not made perfect in love. Love is based on sharing, availability for others and reciprocal trust. This man has left us the most beautiful gospel. Without him the sacrifice of the Lord would not have been shown in its immense generosity. This man, who made his life a true hymn of love, has left us this testament like a legacy that crosses time, like the incense of eternity, to speak to all the nations of the Earth, to tell them to surrender arms, to cease all violence and to protect the water and nature of our earth (which is threatened), so that one day our children will not have to experience war, pollution, famine and injustice. St Irenaeus, Bishop of Lyons who died in 200 gives us some information with regard to the 4 official gospels. The young Mark, whose mother is Mary was the companion and scribe to Peter. It is he who wrote the first of the 4 gospels. 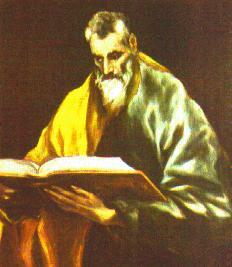 Matthew produced a written version of the gospel in Hebrew at the time Peter was founding the first mission to Rome. The doctor Luke of Antioch, who was the only non Jewish evangelist, completed Mark's gospel by adding all the testimonies given by the apostles. He wrote his text in Greek in 80. These first testimonies would have first been written on Papyrus and then translated into Greek by the transcribers. The first texts engraved on parchments (tanned animal skins) could not be financed until the start of the Constantine era when Christianity became the official religion of the state. In it he shows us that emperor Claudius who reigned 41-54AD promulgated a decree to force those who were led by Christ to leave Rome because of the discord they brought about. The decree is confirmed in the Acts of the Apostles ch18 v2: Paul arrived in Corinth. He came across a Jew called Aquilas who had recently arrived from Italy with his wife Priscilla, because Claudius had ordered all Jews to leave Rome. TACITUS : Roman, non-Christian historian 55-120AD. Under the reign of Tiberius, Christ had to undergo the highest form of punishment, that being crucifixion, whilst He was in the hands of Pontius Pilate, one of our procurators. Although well controlled for a while, Christianity, the source of all evil, spread again not only in Judea but also in Rome. In 64AD, during one of the great fires in Rome, Tacitus mentions Nero's efforts to accuse Christians for all this disaster and decries their persecution.